In many regions of our world, women are still subject to horrible violence. These include bodily abuse, psychological humiliation and social discrimination. In some countries, women are not free to voice their opinions or control their bodies and are even subject to harsh punishments when attempting to revolt against this oppression. It gets even more horrific when women are specifically targeted in warzones, as when they are raped to punish the community they belong to. It is important that the international community never loses sight of these unacceptable acts and never stops acting to put an end to them.The event aimed to keep high the visibility of the issue but also showed what concrete initiatives have been taken and will be taken by international bodies, such as EU and UN, to finally make violence against women history. Mrs Marina Marchetti, Team Leader for Gender and non-Discrimination and Member of the European Commission, illustrated the “Spotlight initiative” that aims to eliminate all forms of violence against women and girls. This initiative promotes gender equality in particular in third countries, and not in the European Union. It takes into account all kinds of women (workers, lesbians, mothers, transsexual, etc. ), but it develops a cooperation that is not humanitarian, so not where conflicts are (hence, it does not take into account women that are refugees). The Initiative is so called as it brings focused attention to this issue, moving it into the spotlight and placing it at the centre of efforts to achieve gender equality and women’s empowerment, in line with the 2030 Agenda for Sustainable Development. 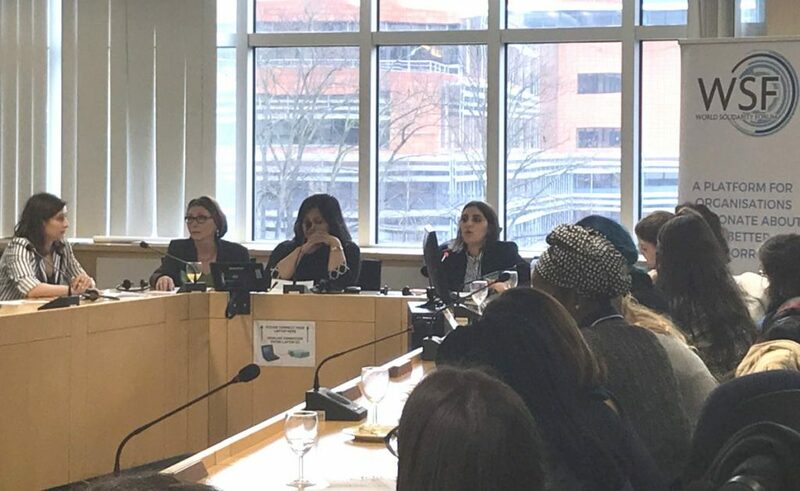 The spotlight activity was launched in September 2017 in the margins of the 62nd Session of the Commission on the Status of Women in an Assembly of the United Nations. An initial investment in the order of EUR 500 million will be made, with the EU as the main contributor. The modality of the delivery will be a UN multi-stakeholder trust fund, administered by the Multi-Partner Trust Fund Office, with the support of core agencies UNPD; UNFPA and UN Women, and overseen by the Executive Office of the UN Secretary-General. For the first time, the Commission decided to spend a lot of money to this issue; therefore it is a strong and important action. Money will be spent around the world in different kinds of abuse such as feminised (Latin America), domestic workers like slaves (China), sexual and gender violence, kidnapping, genital mutilation (Africa) and domestic violence (70% of women in Caribbean are abused). This action is implemented at country level, so case by case, there is not just one solution. For example, you cannot implement the same action in American Latin countries and African countries. It’s a work in progress. The spotlight initiative is in line with international standards, such as the Istanbul convention. There are several goals: service and provision (justice and education), prevention (changing the mind set of people, above of all of men), data collection and women movement support (gender competence).In third countries, women victims of violence are rejected by families and communities after being abused, for this reason they are victims twice. EC is working towards inserting them again into the society. This EC Initiative needs 5 years to being put into practice, but until now the initiative has gone very fast, if you think that this idea was thought in May 2017 and already launched in September 2017. The Spotlight does not include European countries because there are already other policies in the European Union. The very first fundamental rights on gender equality and non-discrimination were already stated with the Treaty of Rome. Equality is a key driver for EU policy and it has become a priority. In 2010, and later in 2015, EC established a gender plan about the cooperation and commercial relations. In this plan there are three priorities: stopping violence, promoting culture and promoting participation in policy making. Now they are adding a new one that is how the Commission works in the development of the policy. In 2015, EU realized that nobody took appropriate actions to violence against women and girls. The 2030 Agenda for Sustainable Development has as main goal the gender equality and fighting against violence by establishing tools for stopping this abuse. The problem is huge, not only in third countries, but also in the EU. For example, in Italy 17 women have been killed by partners or members of the family from the beginning of the year just because they are women, while 1 over 3 women suffer from abuse in their life span. Numbers are frightening, and with immigration there are an increasing number of gender mutilations because people bring their own values. Since this issue is a big problem nowadays, it is important to see how the European Commission has made a very concrete first step by spending money in this problematic situation. The Shared market: the future EU-UK partnership! Global Citizen Education: an ambitious challenge for the EU!